Lo mejor de la cocina hindú y pakistaní se hace hueco en el centro de Madrid y es que cerca del metro de Antón Martín, en plena calle Atocha, está el restaurante Rajasthan Curry. Un destacado en la zona en lo que a cocina internacional se refiere. La carta del restaurante Rajasthan Curry es amplia y variada. Dispone de un menú degustación muy representativo y, si eres un iniciado, te explican las características de cada plato. De esa manera, apreciarás el juego de color, aroma y sabor que hay detrás de platos como Chicken tikka masala, Lamp dupiaza o Prawn masala. Recetas de pollo, cordero y langostinos, respectivamente. 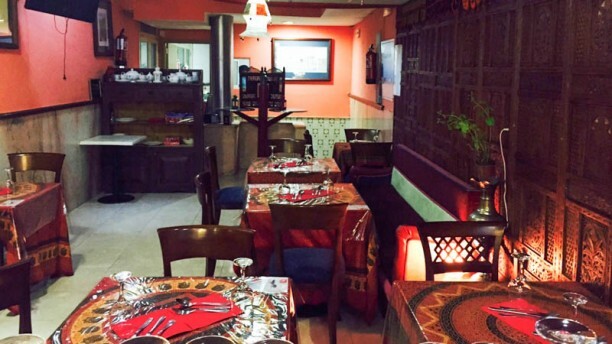 La cocina hindú, rica en productos de la huerta, permite al restaurante Rajasthan Curry	ser también un lugar ideal para el comensal vegetariano. Para todos, el postre casero como el Gulab jaman y presenciar danzas hindús en directo mientras acabas de cenar. ¿Vas a dejar que te lo cuenten? Tasty food and excellent service. We'll be back! God mad, rent sted og god service! we were taken away to another location another restaurant since this one was shut. they didn't have the decency to take our permission or ask if we were willing to go. the promised discount was never given. So seems to be a sham. one shouldn't bother getting attracted to discounts. it's a joke. Average Indian food but good service and good mood. However a bit pricey, we were also not given the 50% discount due to some reasons that didn't seem legit. Muy bien, lo recomiendo ! Nice little Indian restaurant- tasty food and good service. Decent portion sizes. Good for groups of friends rather than a romantic meal. Quite spicy so ask for mild not medium if you do not like hot food. Waiter very friendly and spoke good English which helped as we have bad Spanish. We dined in this restaurant between 21:00 and 22:00 on Thursday evening. Starters: The chicken pakora and the vegetable samosa were so bland that even the punchy piquant mint sauce, which I liked, failed to make an impression. The raita was fine. Mains: I was offered a “medium”, “spicy” or “hot” chicken madras and the hot madras was comfortably hot. We were warned that the chicken tikka we ordered was a dry dish but that was exactly what we expected. The chicken tikka masala which arrived at the table was not what we expected! Only two diners and the restaurant got the order wrong. We couldn’t be bothered to change it. The peshwari nan was good. The restaurant is shabby, particularly the stairs and toilet area which is dilapidated. Presentation and atmosphere is non-existent. The staff were attentive. I was grateful for the 50% discount - I would have been upset to pay full price for this poor experience. Restaurante súper recomendado, la atención ha sido excelente y la comida buenísima. El helado de pistacho increíble. La comida muy buena y el servicio atento. Sólo un pero: la oferta pone sin limitacion de platos y cuando llegas no es así; es una oferta de entrantes, segundo y postre, por defecto. Deberían aclarar esto, o en su defecto, cambiar la oferta. calida precio inmejorable. el local es tranquilo y la atención estupenda. Great food and served with passion. Definitely recommend. Great experience especially for a Londoner.